The Dallas Infinity Limo Rental is one the coolest vehicles around. 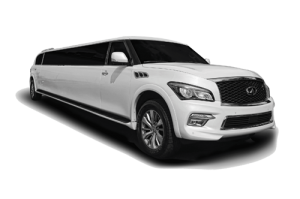 With Gullwing doors and up to 20 passengers, Infinity Limousines will definitely show everyone you mean business. With multiple capacities, sizes, colors and pricing, Infinity Limo Rentals will work for every event around Dallas. Check out our rates and services for High School Dances, Anniversaries, Birthday Celebrations, Weddings, Getaway Cars, Funerals and Corporate Event Transportation just to name a few. Book your Airport Transportation and Shuttle Services with a White Infinity Limo. Our Infinity Limo is a great vehicle option for your next Black Car Service around Dallas. Travel to any Events around Dallas and surrounding counties in a luxurious Infinity Limo. Surprise your significant other with a beautiful Infinity Limo for your next Anniversary Celebration. Celebrating a Birthday or Milestone, consider a 20 passengers Infinity Limo. Black 18-20 Passenger Infinity Limo for Funerals, Wakes and Memorial Services. Take up to 10 couples in this Infinity Limo for your next Homecoming Dance. Infinity Limos and their gullwing doors will make a cool entrance to your next High School Prom. The White Infinity Limo will make her Quinceanera and Sweet 16 a memorable one. Get dropped off and picked up right at the front gates for your next Concert in Dallas in an Infinity Limo. 20 Passenger Infinity Limo is a great option for small groups for your next Dallas Wine Tour. Take up to 20 of your friends on your next Brewery Tour around Dallas and surrounding counties in a Infinity Limo. The Infinity Limo is one of the coolest Limos offered in the Dallas area for Bachelor Party Groups. The Infinity Limo will work great to take you and all guests to and from the Bachelorette Party Events and Venues. White Infinity Limo will make a great exit for your Wedding Getaway Car.